Dart Company Driver Debbie Chapman behind the wheel along with a friend in front of US Bank Stadium. EAGAN, Minn. __ Dart Transit commemorated National Breast Cancer Awareness Month by participating in a fund-raising event that collected over $295,000 for breast cancer research through the American Cancer Society. Dart served as one of the sponsors for the Making Strides Against Breast Cancer Walk held in October at US Bank Stadium in Minneapolis. As part of the company’s sponsorship, Dart brought its Breast Cancer Awareness Truck, featuring a large pink ribbon on each side of the cab, to the stadium. The specially-decaled Dart truck, along with an empty trailer, provided the final activity for those gathered at the Minneapolis edition of Making Strides Against Breast Cancer. Positioned on a flat street outside the home of the Minnesota Vikings and the site of the next Super Bowl in February, the big rig presented an ultimate tug-of-war challenge for a group of women – some of whom are breast cancer survivors – to pull the truck and trailer a distance of 25 feet. While the initial few seconds of the big-rig pull was a struggle, the group employed a strategy of staying low to the ground, working in unison to get the truck rolling and building the momentum necessary to cover the 25 feet. Behind the wheel and ready with the brakes inside Dart’s Breast Cancer Awareness Truck was Debbie Chapman. A breast cancer survivor for nearly 12 years now, Debbie was selected earlier this year by a committee at Dart to serve as the driver of the Breast Cancer Awareness Truck. This group successfully pulled the Dart tractor-and-trailer rig 25 feet. The big-rig pull capped off an event in which 7,800 participants from across the Twin Cities area had gathered to walk a course that took them down to the playing surface at US Bank Stadium. 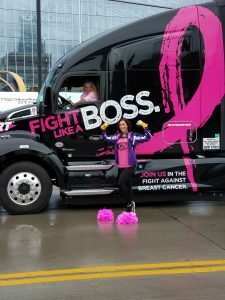 From his perspective, Benson believes the powerful message presented by Dart’s Breast Cancer Awareness Truck will resonate far beyond the big-rig pull – especially as it continues to travel across the nation’s highways. Chosen from a group of applicants submitted to a special committee at Dart, Debbie Chapman presented a compelling personal story to become the company driver selected this summer to be behind the wheel of Dart’s Breast Cancer Awareness Truck. Within her first month at Dart more than 10 years ago, she learned that her mother had been diagnosed with breast cancer. Some 20 days later, Debbie was also diagnosed with breast cancer. Debbie notes that the support she received from Dart during her treatment was a key to her recovery. Debbie’s mother is a breast cancer survivor as well. 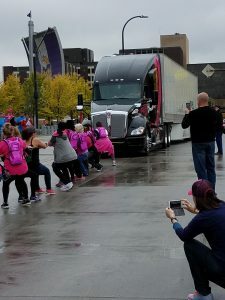 Podcast Featuring Big-Rig Pull & Interviews: The Dart Network Podcast was onsite at US Bank Stadium, chronicling the Strides Against Breast cancer event in Minneapolis and the big-rig pull. To hear a moving interview with Dart driver and breast cancer survivor Debbie Chapman as well as other participants at the Minneapolis event, listen to Dart Network Podcast segment featured below.